The level of support given to university students may be cut, a Labour assembly candidate has said. Julie James, deputy minister for skills in the last Welsh Government, said Welsh students will "always be better supported" than others in the UK. Under the current system, students receive an annual grant for their tuition fees worth up to £5,190. But she said there may be "nuanced changes" depending on the outcome of a review by Prof Ian Diamond. On Friday, Welsh Labour leader Carwyn Jones told BBC Wales that cutting the grant to below £5,000 was "not something we're looking at the moment". Speaking at a Labour campaign event in Aberdare on Monday, Ms James told BBC Wales: "We're committed to continuing our current policy until Professor Diamond reports in the autumn. "And then we're committed to an evidence-based policy after that, with the commitment that Welsh students will always be better supported than their counterparts elsewhere. "There might be nuanced changes. "We're not committing to £5,000 because that might go up or down depending on what Professor Diamond says." An interim report in December said most of the evidence said the current policy was "not an option", but there was no agreement on the best alternative, with the final report due in September. The Welsh Conservatives would also scrap tuition fee subsidies, but have said they would pay half of students' rent costs. 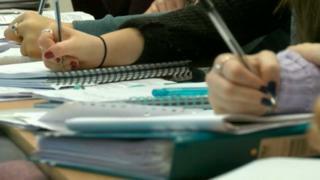 Plaid Cymru has pledged to write off £6,000 a year in debt for students who stay in Wales to work after completing their studies. Responding to Ms James's comments, Plaid education spokesman Simon Thomas claimed there would be "a huge black hole in Labour's budget if they don't explain what they will do with their tuition fee policy". The Welsh Liberal Democrats' policy is to replace tuition fee subsidies with maintenance grants, while UKIP says it would like to cut tuition fees. The Greens have called for free university tuition across the UK.